✔ STRONG PLASTICITY: It is vety easy to form shapes, soft clay is environmental protection, good toughnesss, moderate hardness and non-toxic.You can make many kinds of artwork depend on your imagination. 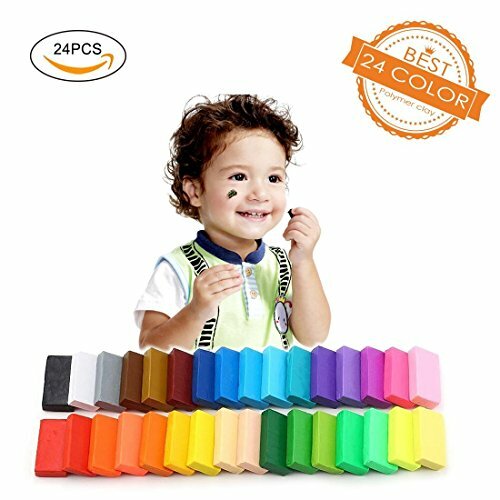 ✔ 24 COLORS: This colored modeling clay pack of 24 vibrant colors, get this 24 colors modeling clay back home for your daughter or son is not only a box clay but an endless imaginative and creative possibilities. ✔CREATED IMAGINATION : Good for miniature and advanced Polymer Clay crafts, such as ploymer clay flowers, dolls, cakes, etc. Of course you can use. It for other kind of craft as well. Use your imagination. ✔ COLOR INSTRUCTION: The picture just for reference and the color will be supplied randomly, while basic color will be included. My kids loved these !!! !